Smart meters have two-way communication capability between electric utilities and customers. One-way meter-to-utility communication, also known as automated meter reading (AMR), was more prevalent before 2013. Since then, two-way AMI smart meter installations have been more common based on data collected in EIA’s annual electric utility surveys. Two-way AMI meters allow utilities and customers to interact to support smart consumption applications using real-time or near real-time electricity data. Smart meters can support demand response and distributed generation, improve reliability, and provide information that consumers can use to save money by managing their use of electricity. AMI data provide utilities with detailed outage information in the event of a storm or other system disruption, helping utilities restore service to customers more quickly and reducing the overall length of electric system outages. 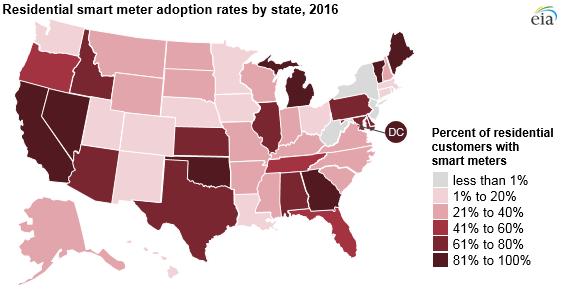 Differences in smart meter penetration rates are often driven by state legislation and regulation, as some states require that regulators approve utilities’ cost recovery mechanisms for metering projects. The Smart Electric Power Alliance publishes reports on state-level actions on advanced metering, among other topics. Many residential customers may not be aware that they have a smart meter. EIA last conducted the Residential Energy Consumption Survey (RECS) in 2015, a year when residential smart meter adoption was about 44% nationwide. In that year, 22% of households reported having a smart meter, 49% reported not having one, and 29% responded that they did not know. Only 8% of households reported being aware that they had access to hourly or daily data, and just 4% said they had accessed or viewed that data.